I am trying to locate further information on the parents of James Weir (born in Green Street, Saltcoats ~1848). His Father (James Weir) and Mother (Mary Milligan) were both born in Ireland. How can I determine their place of birth? I welcome advice on how to proceed. Here is the 1851 census entry that gives the family details. I'm afraid you are going to find things very difficult. All four of my grandparents were born in Ireland. Fortunately we know when and where. However, trying to go any further back in Ireland is virtually impossible, as there are no records existing anywhere prior to 1854. I spent a considerable amount of time in County archives, cemeteries and visiting many parish priests where I was given access to their BDM records. The only thing that offered some help was the Griffiths valuation, but for this you would need to know where they were born or lived. Thanks for your insight John. I realise that the Irish connection is problematic, especially without a place of residence). I had hoped that there would be birth records for either of the two children (born in Ardrossan parish) that might indicate the place of birth of the parents. 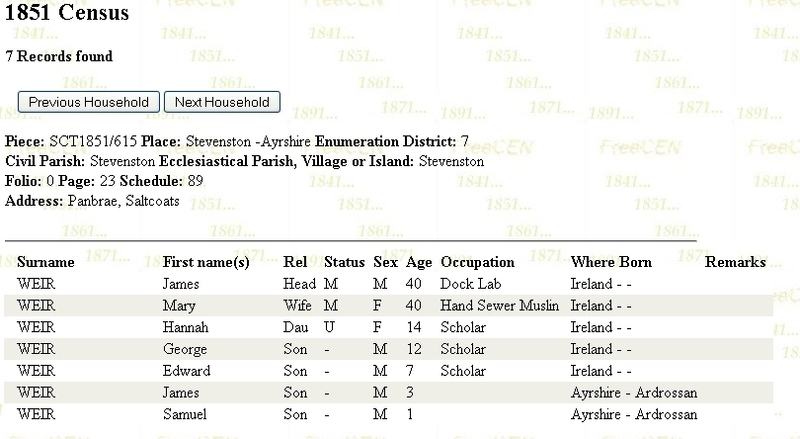 Unfortunately, both dates of birth are earlier than the records available through http://www.scotlandspeople.gov.uk/" onclick="window.open(this.href);return false;. Perhaps death certificates for the Irish born couple would include place of birth? Check the 1861 Census for the family. If you're lucky you'll find another child born to this couple between 1855 and the time of the 1861 census. The parent's marriage, date and place will be on that child's birth certificate. If you're really lucky and find a child born during 1855 it'll be a gold mine of extra information. 1855 was a very special year for Births, Marriages and Death certificates - it was the first year of civil registration in Scotland. you may want to try: Proni.gov.uk it is the public records of Northern Ireland's web site. My thanks to ellenadamson, huey1 and mckay47. I will explore your suggestions and report back on any progress. where did James and Mary marry? ireland? if so then you may be fortunate they married in the bride's parish church, and even luckier if it is her family church in ireland where she was baptised. i have had success along this line before twice. goldmine. also try http://www.pensear.org" onclick="window.open(this.href);return false; as they have data of old age pension returns taken from the irish census returns from 1841 and 1851. the originals are in proni. anyone in 1907 who was 70 and qualified for the new old age pension return in ireland would have had their families census returns checked from these 2 census years. it aims to confirm their age as they wouldn't have had a birth cert as civil reg didn't start in ireland for births until 1864 hence the look up needed by the enumerators. worth trying. if you do find something worth checking, don't pay pensear but try your local lds family history centre for a free look up if they hold them. or the belfast forum for volunteers who go to proni. good luck. Thanks bobthebarber,i've just found my G Grandfather on that site.